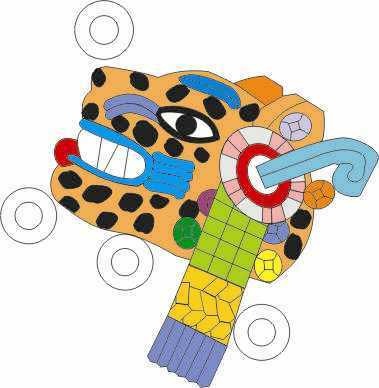 Nahui Ocelotl (Nahui = 4, Ocelotl = tiger). The Age of Gold, when everything belongs to everyone, there is no difference between what belongs to one or the other. The Universal Cosmic Principles reign and there are no psychological defects. It is the very same paradise discussed by many religions. In India this epoch is called Krita Yuga (Krita = Work, Yuga = Epoch) because it is the spring season of each race in which “reigns the truth, Justice is kept firm and no benefits alter the iniquity of men” (Laws of the Manu 1, 81). The Age of Silver when conditions start becoming less spiritual and beings are more identified with matter, but cosmic principles continue to reign. In India, this epoch is called Treta Yuga or the summer season of the Race. During the Age of Copper wars start, frontiers and borders are declared, egotism is born, etc. This is the Dwapara Yuga of India or the autumn season of the race. The final epoch is the Age of Iron or Kali Yuga, the winter season of the race, when there is total degeneration, a true reflection of our condition of existence today. The human beings of the first race were able to transcend the laws and preserved themselves in the Age of Gold. They were beings full in Wisdom – they were devoured by the tigers of wisdom. They became tigers, warriors, authentic felines of revolutionary psychology. They launched upon themselves, against their own psychological defects.